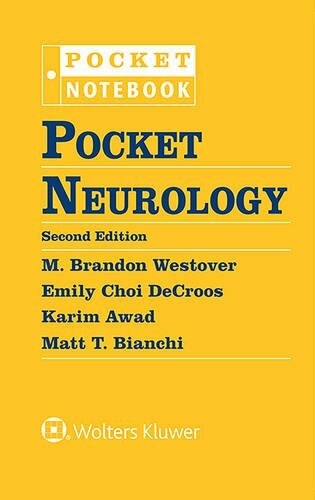 Written by residents for residents, Pocket Neurology, 2nd Edition is your go-to resource for essential neurologic information in a high-yield, easy-to-use format. Concise and well organized, it provides must-know information on hospital- and clinic-based neurologic workup, diagnosis, and management. The second edition of this pocket-sized bestseller delivers highly relevant adult neurologic coverage in an easily portable source. Find what you need quickly and easily with concise text, numerous tables, and bulleted lists throughout. Progress logically from neurologic signs and symptoms to differential diagnosis, workup and diagnosis, assessment of risks and benefits of available treatments, to treatment and prognosis. Focus on the most important, highly relevant facts thanks to a, streamlined presentation that allows for more algorithms, tables, diagrams, and images. Stay up to date in every area of neurology with significantly revised chapters on stroke, epilepsy, dementia, and MS, and more drug dosing information regarding inpatient care. Consult this high-yield handbook by clinical presentation, such as coma, stroke, headaches, and seizures, or by special topic, such as neuroimaging, behavioral neurology, and sleep medicine. Learn from neurology residents and beginning neurology fellows in collaboration with attending neurologists at the Massachusetts General Hospital, Brigham and Women’s Hospital, Children’s Hospital Boston, and Beth Israel Deaconess Medical Center.